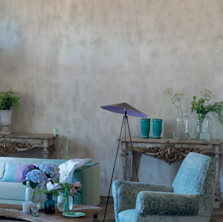 Wallpaper and Designer Home - current wallpapers for both residential and commercial markets. ....How Much Wallpaper Do I Need? 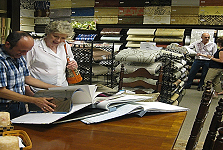 All wallpaper is priced in single roll (s/r) quantities and in most cases it can only be ordered in double roll quantities. There are a limited number of patterns that must be ordered in triple rolls. A single roll of wallpaper will cover approximately 28 square feet (double roll will cover approximately 56 square feet). With all wallpaper projects because of cutting and trimming there tends to be some waste so to play it safe you should count on a single roll of wallpaper covering 25 square feet (double roll 50 square feet). If you are confused call us for assistance. Just kick back and let the pros take care of everything. The other important factor in considering how much wallpaper you will need is the size of the pattern repeat of the particular wallpaper you select. 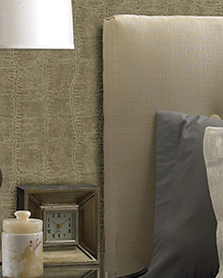 Follow these easy measuring steps to determine how much wallpaper you will need. Multiply the Combined Width by the height of the walls – this is the total square footage (“TSF”) of wall space you need to cover with wallpaper. The final step is to factor in the pattern repeat. If the pattern repeat is 18” or less then divide the TSF by 23, if pattern repeat is 19” to 25” then divide the TSF by 20. This final number is the total number of single rolls of wallcovering that is required for your project. If the pattern does not have a repeat (random match) then just use the TSF from step 3 above. A pattern repeat is how frequently a shape or image appears in a strip of wallpaper. To create a seamless effect each strip of wallpaper needs to be lined up with the pattern repeat of the previous strip. The bigger the repeat the more waste 6nd the need for more wallpaper. The smaller the repeat the less waste and the less wallpaper you need. So a pattern repeat of 18” means that you will see the image every 18” in a strip of wallpaper. A Random Match means there is no pattern repeat which means there will be very little waste and is easier to hang than wallpaper with a repeat. Measure each wall in feet and multiply by height, this will give you the square footage of each wall. Add the figures of each wall together and divide by fifty. Fifty-five to sixty square is what you get on a double roll of paper. Use the calculate below for the number of rolls. Remember its best not to subtract for doors and windows to make sure you have enough materials. Of course for larger repeats we recommend allowing little more paper. The majority of border is packaged and sold in 15 foot spools as a single unit. Occasionally some manufacturers will sell by the lineal yard and they will be packaged in 5 yard spools (3 feet to a yard so 15 foot spools). To determine how much border you project requires measure the width of each wall where you are going to hang the border. Add them all together and you now have the total number of lineal feet of border your project will require. Divide this number by the amount of border in a spool which will be identified on the product detail page of the border that you are interested in. The vast majority of border on our site is sold in 15 foot increments. The following is a conversion table for border that is sold by the yard. Some border comes in a mural size and they are sold by the unit. Typically they are 12’ feet long. If you are ordering multiple wallpaper patterns you should wait to make arrangements with us until you have received your entire order. Take the hassel out of wallpapering and hire us for your next project. You always want to order a little too much than not enough. The last thing you want is to run out of wallpaper and have to reorder since it is difficult at times to get the same run and dye lot numbers. To keep things simple and to ensure you have enough paper do not make any deductions for windows, doors, cabinets, etc. If you are confused get confused, please call us for assistance.